I’ve got a wedding to go to this weekend. My friends Adam and Jillian are getting hitched. There’s going to be a big dinner and they’ve booked an awesome old plantation along the river and it’s going to be a wonderful and lavish affair, but it’s just going to be the two of them getting married. 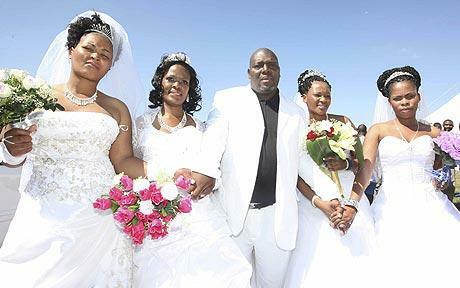 Milton Mbhele, on the other hand, recently got married to three women, Zanele Langa, Happiness Mdlolo, and Smangele Cele, and remarried to his first wife, Thobile Vilakazi. He managed to cram four weddings into one ceremony. Get them all out of the way at once, genius! I almost titled this article “The Many Loves of Milton Mbhele,” but I figured nobody would get the reference. I could have also called it “The Many Children of Milton Mbhele,” as he’s got 11 of them, but they’re not the center of the story and he didn’t elaborate on who their respective mothers were. It’s about time he found some nice girls and settled down, even if he did save a little money on wedding costs.